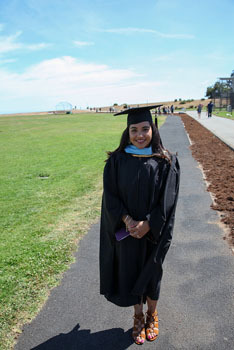 Laura Acantar, after receiving her master's in education and her teaching certificate, will teach at the Watsonville elementary school where she was once a student. Personalized graduation caps were all the rage this year. It was not unusual to see the graduates showing off their dance moves. 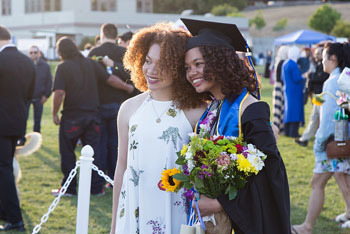 UC Santa Cruz has always been a combination of intellectual heft and quirk, so it made sense that graduates wore Bermuda shorts beneath their gowns and leis around their necks. It was hard to blame them, considering the balmy temperatures. 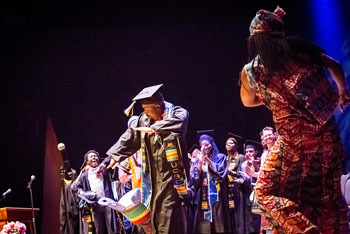 Ceremonies for UC Santa Cruz’s 10 colleges, graduate division, and Baskin School of Engineering, took place June 10-13 with 3,330 undergraduate and 175 graduate students participating. 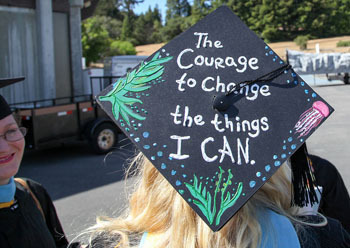 In all, more than 4,700 UCSC students earned undergraduate and graduate degrees during the 2015-2016 academic year. Some things never change: parents grumping about the uphill walk from their parked cars, and the fact that the shaded seats were jam-packed; sunny seats not so much. But this year stood out in several ways. This was the 50th anniversary edition of the graduate division commencement, which was much more well-attended than the first-ever ceremony a half century ago, when a single Ph.D. candidate arose to receive a diploma. This year also had an unusual number of high-profile alumni taking the podium to deliver commencement addresses, including New Yorker writer William Finnegan (Cowell, ’74, English literature) winner of the 2016 Pulitzer Prize for his memoir Barbarian Days: A Surfing Life. Finnegan spoke to Cowell graduates Saturday afternoon. Hoffman also urged Kresge graduates to remain true to themselves and their dreams–and shared sobering stories of rock stars who struggled with hidden torments. Silva urged graduating Porter students to honor their elders: the mentors, the guiding hands, who showed them the way. At the graduate division ceremonies at the East Field on Friday, Robert Majzler, getting ready to receive his Ph.D. in psychology and feminist studies, demonstrated that same spirit: paying tribute to a caring mentor who had a strong and nurturing influence on his life. His guiding light was Professor Aaronette M. White, associate dean of equity and social responsibility in the Division of Social Sciences, who died at age 51 in 2012. She was a highly regarded professor of social psychology. Everywhere you looked at the East Field, prior to the graduate division ceremonies, students shared stories of self-reinvention, of paying back to a community, of taking risks and pursuing ambitions. Laura Acantar, on the verge of receiving her master’s degree in education, attended the Alianza Charter School in Watsonville as a child. Now she’s heading back to that school, this time as a second-grade teacher. “I always wanted to go into education because I wanted to see teachers who looked like me,” she said. Acantar is a strong believer in bilingual education. “It helped me value my language and culture,’’ she said. Now she is teaching in a dual immersion program. “I just want to go back and be able to do for others what my teachers did for me,’’ Acantar said. Standing in the field house, the graduate students took the time to think about their missions, their purposes, the reason for the long hours of study and hard work.